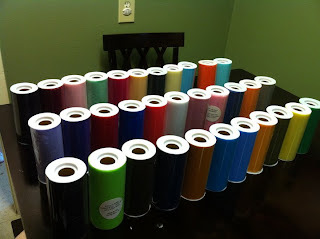 So I went a bit overboard the other day and purchased WAY too much tulle. I've noticed that I have a bad habit of diving headfirst into things when I get excited about them. Those are 6" spools of 25 yards of tulle each. Add it up and it comes to 825 yards of tulle. Eek! Time to start making some tutus! 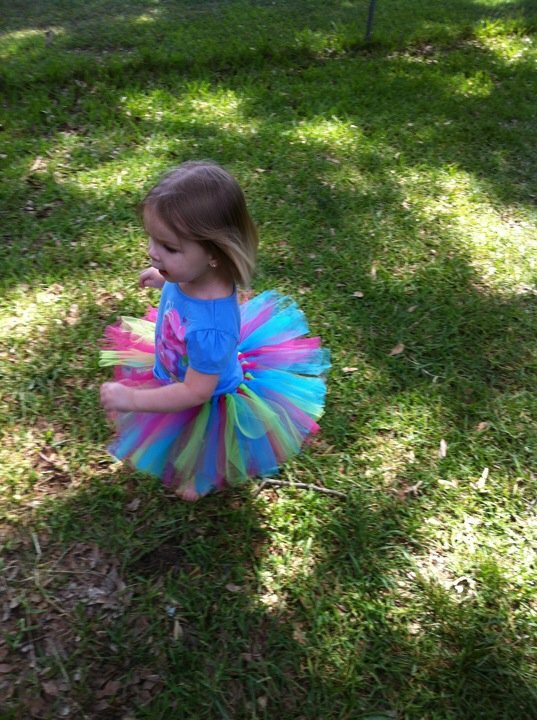 That's my daughter, Scarlett... having fun in her new play tutu. Anyway, I liked the elastic, but it stretched as I worked with it and I ended up having to cut a few more inches off and resewing the band to make it fit the way it should. I wanted to see if I could make one with a ribbon so that the size wouldn't drastically increase as I was working with it. Something to support your tutu during the crafting. I used our pickle jar for both tutus and I LOVE my pickle jar. Just be sure little curious fingers can't pull it off of your work surface or you'll be one sad panda. Step Two- Tie knots in your ribbon, leaving the child's waist measurement empty in the middle. I measured 24" in and tied a knot there. Then, measured 24" in on the other side and tied another knot... leaving a gap of 17" (child's waist measurement) in the middle. Step Three- Cut your strips of tulle. I usually lay the strips on top of each other while I'm cutting to make it quicker and easier. Think about how far you want your tutu to fluff out, then multiply that by two and add an inch for the knot you'll need to secure it in place. I was making this for a younger child and I wanted it to fluff out 7.5" (it's not an exact science, I just eyeballed my cutting board and thought, "That length looks good"), so I cut the strips 16" long. (7.5" out from the body x 2 +1" for knot) I guesstimate on cutting and just cut until I'm bored with it. Step 4- Tie your ribbon around your holder (pickle jar) loosely but so that it's not going to slide down to the bottom. Then put two pieces of tulle together, bend in half to form a "U" and slide behind ribbon. Pull tulle through the "U" to knot onto ribbon. Continue Step 4 around the ribbon (alternating colors if you are using more than one) to the knot on the other side. Prettiest pickle jar in all the land! Thats so lovely for all our little princess'. I'm thinking that I might try to make one for my granddaughter. Thank you for the idea.